He saved himself the trouble of climbing the 12 kilometers or so to Sankta Cristina, from where the road was closed. 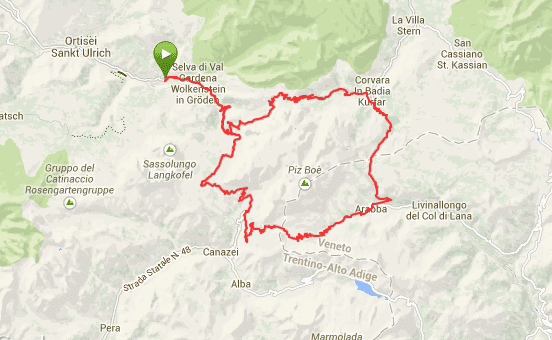 So, he only had to climb the last part of the first pass, the Sella – a total of 12.75 km, with 785 altimeters. The Sella was first, since it was ‘advised’ to go counterclockwise; in Plan de Gralba (profile of the Sella from there) you can also go left to climb up the Gardena Pass. 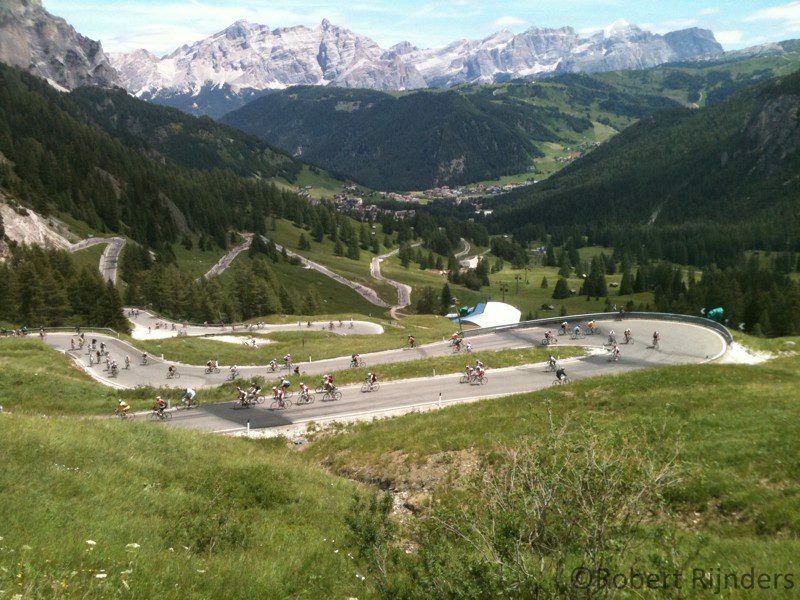 After the descent towards Canazei, the climb to the Pordoi pass was less demanding (profile – the route joined this climb at around 1,820 meters, so only the last 7k were actually climbed). The following Campolongo was almost a breeze (profile), but since he had seen the final pass – the Gardena, albeit from the passenger seat of the car – the day before, he suppressed the urge to go full speed. This final pass in the Sella Ronda is also not too difficult, but more demanding than the profile suggests – this pass is the one with the best views. Almost resembling the Stelvio from some vantage points (see picture above), but less than half as long. Total for the day: 66.2 km / 2,641 altimeters. Tomorrow he’s planning on taking on the Kronplatz, but given the nature of the second part of that climb (unpaved), he’s not altogether sure about it. Some more pictures on my Google+ page here.